One-time Chargers general manager Bobby Beathard said he tried to lure University of Iowa football coach Kirk Ferentz to lead the NFL team. “I tried to hire coach Ferentz years ago,” Beathard said. Beathard was unsure of the year he attempted to land Ferentz, but said he thought it was "around Gilbride." The Chargers transitioned from Kevin Gilbride to June Jones in 1998. The Hawkeye coach declined to confirm the discussion or timing of it through a university spokesperson. 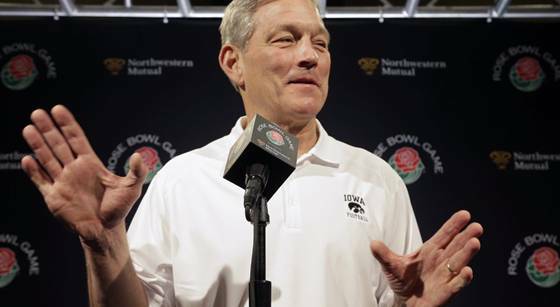 Ferentz and the former Chargers boss remained in touch. Iowa’s coach, who will be tied with Oklahoma’s Bobby Stoops as the longest tenured coaches at one program after this season, later recruited Beathard’s grandson, C.J. The younger Beathard, who visited his famous grandfather in the Oceanside area as a kid, is scheduled to start at quarterback for Friday’s Rose Bowl matchup with Stanford.